Nothing announces the arrival of summer like a bathing suit and a sprinkler, but when your kids tire of jumping through the water’s spray, give them a few new wet and wild games to play. Round up your old newspapers and a couple water-filled buckets, and then take your kids outside for this sloppy, silly “fashion” game. Using nothing but water-dampened newspapers, have your kids take turns creating head-to-toe looks for one another. Once they’re happy with the outcome, they can strut their stuff down the sidewalk in a full-fledged fashion show. Parents: be sure to have your cameras ready! Pull out your old baby pool (a rectangular one works best) and fill it up with water. Provide your kids with popsicle sticks, paper, plastic wrap, glue and any other supplies you can think of that they might want to use to create and decorate a boat. Give them a few tips on how to make a boat that will float, but otherwise leave them to their imaginations. When they’re done, set up a boat race in the baby pool to see which boat is the fastest. Here’s the twist: boats can only be moved by blowing them across the water with air through a straw. 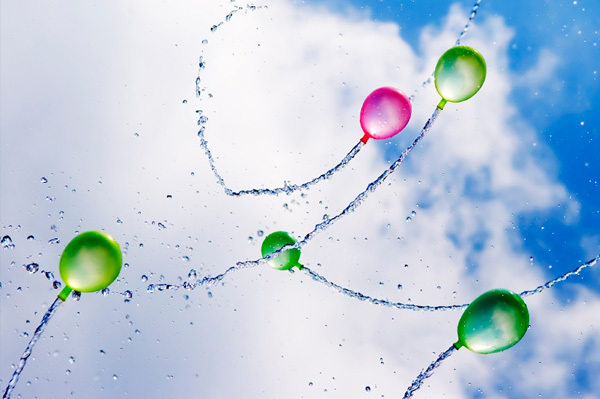 When you’re hosting a crowd, water balloons are always a hit, but to keep the chaos controlled, try setting up a game of water balloon volleyball. Simply set up a volleyball net or string a rope between two posts, and then split the kids into groups of two. Give each group a towel or sheet and instruct the teams to hold it between them to create a landing mat for water balloons. With one team on each side of the net, the players use their towel or sheet to toss the balloon over the net to the other side. Every time a team drops a balloon, the balloon breaks or the balloon doesn’t cross over the net, the opposite team earns a point. Play to eight points before switching out teams.